Montenegro (Albanian: Mali i Zi, Montenegrin: Црна Гора / Crna Gora [t͡sr̩̂ːnaː ɡɔ̌ra] , meaning "Black Mountain", is a country in Southeastern Europe. It has a coast on the Adriatic Sea to the south-west and is bordered by Croatia to the west, Bosnia and Herzegovina to the northwest, Serbia to the northeast, Kosova to the east and Albania to the south-east. The country's name in most Western European languages reflects an adaptation of the Venetian Montenegro (< Latin mons "mountain" + niger "black"), roughly "Mount Black" or "black mountain". While under Venetian rule, the coast of present day Montenegro was called "Albania Veneta" which means Venetian Albania. This was likely due to the common population around those parts. There are no written records for the name, but we do know that the region we call today Montenegro was under the influence of the Venetians, which explains the Latin name. The name in Latin means "Black Mountain" but no one knows why the region is named inappropriately as it has not "one" mountain but a rather diverse mountainous terrain, such as which is never black. We do know however, that the coastal part of present day Montenegro was once called "Albania Veneta" which means "Venetian Albania". This was likely the case due to the common language spoken in the region at that time. Albanian being the common language, it would make sense that the region being called "Highland", as it is the name for the area inhabited by Albanians of Montenegro today. This being so, given it's mountainous terrain, it is like that the native name for the region was "Highland", as it is the name for the area inhabited by Albanians of Montenegro today. Thus is likely that the name of the region which Albanians call "Malsi" (Highland) was misinterpreted by the Venetians as "Malzi", which in Albanian means "Black Mountain". Hence the misunderstanding in the Albanian dialect, caused the placed to be called "Malzi" or "Montenegro" in Latin, hence Black Mountain, rather than "Highland" (Malsi) as in the native tongue. Ancient authors such as Pliny, Appian and Ptolemy mentioned the Illyrian tribe of the Docleatae as living in the maritime region, holding the town of Doclea (old Podgorica). They were composed of parts of the Taulantii, the Pleraei or Pyraei, Endirudini, Sasaei, Grabaei, Labeatae that came together after the Great Illyrian revolt. The Docleatae had 33 decuriae. In 9 AD the Romans conquered the region. Slavs colonized the area in the 6th century, and had by the 10th century formed a semi-independent principality called Duklja in suzerainty to the Byzantine Empire. Duklja gained its independence from the Byzantine Roman Empire in 1042. Over the next few decades, it expanded its territory to neighbouring Rascia and Bosnia and also became recognised as a kingdom. Its power started declining at the beginning of the 12th century. After King Bodin's death(in 1101 or 1108) several civil wars ensued. As the nobility fought for the throne the kingdom was weakened and by 1186 it was conquered by Stefan Nemanja and incorporated into Serbian realm as a province named Zeta. After the Serbian Empire collapsed in the second half of the 14th century, the most powerful Zetan family, the Balshay (Balšićs) , became sovereigns of Zeta. 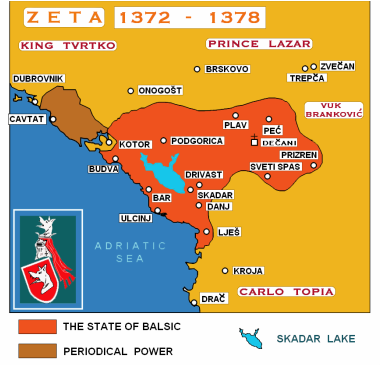 In 1421, Zeta was annexed to the Serbian Despotate but after 1455 another noble family from Zeta, the Crnojevićs, became sovereign rulers of the country, making it the last free monarchy of the Balkans before it fell to the Ottomans in 1496, and got annexed to the sanjak (Ottoman District) of Shkodër. During the reign of Crnojevićs Zeta became known under its current name – Montenegro. For a short time Montenegro existed as a separate autonomoussanjak in 1514–1528, another version of which existed again between 1597 and 1614. The Balshays (Serbo-Croatian: Balšićs) were among the Albanian independent principalities, which flourished after the mid-century. XIV, the most important was what Balsha family originally from the town of Balëz, near the city of Shkodra. During the Serbian occupation of the area, the name of the family remains in the dark. However, there is reason to believe that was one of the doors Balshaj many Albanian noble, expropriated and mistreated of this area, which is about 1,331 more archbishop of Bar, Guljelmi of Adah. However, after mid-century. XIV, three brothers Balsha, Strazimiri, Balsha George I and II, and put the family at the forefront of policy and Albanian statehood process by using the appropriate moment that followed the death of Stefan Dusan car. With the unbundling of its Empire, Balshaj brothers set to work to turn Genta (Twenty), as Dioklenë the former, in an independent state by the Serbian kingdom. For this purpose, they cut off any connection with the new courtyard of the Serbian Tsar Stefan Uros, who Balshaj considered "rebels" and treated as his implacable opponents. Gentes against Albanian rulers, he tried to encourage Slavic rulers and the Republic of Venice, which feared Balshaj empowerment and especially their returns in a principality of marine principality. Possession of Ulcinj, Bar of Shkodra itself and the Shirgjit scaffolding, as well as eventually shtënien Buduës up on 1367, Balshaj were able to control trade movements across the Adriatic. After the establishment of Albania as part of the Ottoman Empire, the Malësia people sided with the Montenegrins for many centuries to come, fighting the Ottomans. However, when the famous Albanian Nobles, called Bushatli, ran northern Albania, the Malësia people gave up their alliance with the Montenegrins and allied with the Bushatli as they were of Albanian blood and heritage, although officials of the Ottoman Empire. During the Ottoman occupation, Malësia people have had the most rights among many peoples of the Balkans. Most of the time they have refused to pay taxes, give soldiers to the Ottoman Army, and accept the laws of the Ottoman Empire. The People of Malësia participated actively in the League of Prizren, which was an alliance among the Albanians as a result of weakening of the Turks and raising new powers in the Balkans, namely the Serbs and the Greeks. The League was called by Ali Pasha of Gucia, a region culturally and ethnically belonging to that of the Malësia e Madhe region. The League chose its leader from the city Dibra, his name was Iljaz Pash Qoku-Dibra. The League was divided into two main fractions, that of those who wanted Albania to remain under the Ottoman Empire, like Abdyl Frashëri and Ali Pasha of Gucia, and those who sought total independence from both the Ottomans and the Slavs, like Marash Lula from the Dukagjini Region. Malësia sided with those who sought full independence. Later, as the Ottoman Empire betrayed Albanians by making a deal with the Slavs and Greeks to split Albanian into four of five pieces, all leaders of the League of Prizren fought against the Turks. Ali Pasha of Gucia became one of the most distinguished anti-Ottoman leaders. In the Selca Village of Kelmendi, the Heads of Malësia along with the intellectuals and social and political activists from the city of Shkodër drafted a memorandum through which they requested the independence of Albania from the Ottomans. This was the first and boldest request for freedom made from Malsia during the 424 years of Ottoman occupation. The meeting was considered so important that leaders from all over ethnic Albania participated. Some of the participants did not sign the memorandum out of fear of persecution. On April 6, 1911, at the Battle of Deçiq, the Malsia fighters reached the top of the strategic hill of Dečić (Deçiq). Many of them died that day, but they were able to crush the Ottoman forces and raise the Flag of Albania after 432 years of occupation. This was the first time Albanians raised their Flag since the Castle of Shkodër had fallen in 1479. About a year and a half later, with the help of the Austro-Hungarian Empire, the Albanian Flag was risen officially in the southern town of Vlora. In 1913 when the European Powers established the borders of the Balkans, they split Malsia in two parts. Gruda, Trieshi, Koja part of Hoti and many villages around Lake Scutari and the Adriatic Sea that were descendants of Malsia, were given to Montenegro, while the rest of Malsia remained within the Albanian border. Venetian Albania (Albanian: Shqiperia Venedike, Italian: Albania Veneta) was the name for the possessions of the Venetian Republic in southern Dalmatia and the west coast of Albania that existed from 1420 to 1797. It originally covered the coastal area of what is now the coast of Montenegro and Albania, but the southern parts were lost to the Ottomans between 1478 and 1571. The Albanian region of Montenegro is still refered by the Albanians as Malesia (Albanian: Malësia), to mean the "Highland". The geographical region of Malësia is shared between Montenegro and Albania. It stretches in south-eastern direction from Podgorica towards the border with Albania. The region is natural and extends to Malësi e Madhe District in Albania, and is inhabited mostly by ethnic Albanians.The region's population is 10,339. The biggest settlement in the area is the town of Tuzi. The region is roughly administratively defined as Tuzi urban municipality, a subdivision of Podgorica municipality. Albanian-inhabited villages of Hoti, Gruda, Zatrijebač (Albanian: Triesh) and Kojë are part of the wider Malësia-region (Malesija), located in Montenegro. Hoti is a Catholic Albanian village that is the brother village of Trieshi. Geographically, Hoti lies on the border separating Albania and Montenegro, on the north shore of Lake Scutari. Hoti is regarded as the leaders (bajraktar) of Malësia e Madhe. Grudë is a village of Malësia that, along with Hoti, was instrumental during the Ottoman resistance. The mountain of Dechiq (Dečić), where the famed battle against the Ottoman conquerors took place, is located here, as is Tuzi, the de facto "capital" of Malësia. Grudë is mostly Roman Catholic but with a sizeable Muslim minority (20-30%). The Church of Grudë, known as Prifti, is the oldest church in the region, and it is not only an Albanian landmark, but, having been built in 1528, provides the most concrete date for tracing back ancestry. Trieshi is commonly considered the "younger brother" of Hoti because they derive from the Hoti clan, as they share a common ancestor, Keq Preka of Herzegovina. The people of Triësh were, along with their Hoti brethren, known for their role during the Ottoman resistance. Specifically, they are said never to have given in to political or religious suppression by the Ottomans; and, as a result, they not only retained an overwhelmingly Catholic population, but they never willingly paid any taxes or tribute to the Ottoman pashas. The villages of Trieshi are Rudina, Nikmarash, Budza, Muzheck, Stjepoha, Delaj, Benkaj, Poprat, Cemi and Koritë. Kojë ( Koja e Kucit) is on of the seven Northern Albanian tribes of Malësia. Koja is the Albanian Catholic tribe of Koja e Kuçit, the name derived from a combination of the Albanian Koja tribe, within the mountain. The people of Koja are referred to as Kojan(e). Koja's sons and daughters, together with other Christian Albanians and Slavs, gave their lives fighting Turks for centuries to keep their Catholic identities alive during 500 years of occupation. Pretash Zeka Ulaj from Koja was one of the Malësor leaders that led the region to its freedom when fighting in 1911 in the Battle of Deçiq, alongside the famous Ded Gjo Luli from Hoti. Dokë Preci Krcaj, Cakë Uci Ivanaj, Gjeto Toma Kolcaj, Tomë Uci Ivanaj, Kolë Doka Marashaj, Marash Leca Gjokaj, and Gjeto Gjeka Ivanaj are remembered as Seven Heroes of Koja for giving their lives in the Battle of Deçiq. Tuzi (Montenegrin, Bosnian: Tuzi, Тузи, pronounced [tǔːzi]; Albanian: Tuzi) is a settlement in the Podgorica Municipality, Montenegro, located along a main road between the city of Podgorica and the Albanian border crossing, just a few kilometers north of Lake Skadar. The town of Tuzi is situated in the region of Malesia.It is the largest and most important town in the region. The Albanian community of Tuzi descend from the surrounding tribes of Hoti, Gruda (Grudë),Zatrijebač (Triesh) and Koći (Koja). The Malësor Albanians consider Tuzi as an important cultural and traditional center for their people. In 1911, for the first time since the era of George Kastrioti, the Albanian flag was risen on top of the Dečić Mountain in Tuzi during the Battle of Dečić. In the battle, Ded Gjo Luli led the Albanians to victory against the Ottomans which marked the turning point in Albanian self-determination. Gucia (Albanian) Gusinje (Montenegrin) or Гусиње (Serbian), in Albanian as Gucia and in Ottoman Turkish was (گوسن) "Gusna." The founder of modern-day Gusinje was Dedë Shala, an Albanian Catholic. In 1455, Shala converted to Islam and became known as Omer-aga Shala. Shala was then awarded lands throughout the region from Ottoman authorities. His son, Hasan-aga Omeragaj built the first house in Gusinje upon the Grncar river, creating the Omeragaj branch in Gusinje. His other son, Tahir-aga Omeragaj created the Omeragaj branch in Plav. The Omeragaj (later Slavicised to Omeragići) family was the ruling family of Gusinje from 1461 up until the arrival of Veli Bey and his sons Ahmed, Redžep, and Ibrahim, who were Persians of Turkic origin that settled in Gusinje from Khorasan in 1590. From Veli Bey's son Redžep Pasha sprung the Redžepagić family, which grew to become one of the most prominent families in Gusinje for the remainder of Ottoman rule. According to Ottoman documents in Istanbul, dated from 1852, Gusinje was part of the Vilayet, or province, of Kosovo. Ottoman rule was passed onto Montenegro by decision of the Congress of Berlin in 1878. However, this decision was unpopular among the local population, the majority of whom were ethnic Albanians in the League of Prizren. The local Albanians and the League of Prizren asserted they would not surrender their territory to Montenegro. The Ottoman Empire desired to comply with the Treaty of Berlin but also wished to avoid risking new revolts among the Albanians who comprised a large part of their territory and were perceived to be generally loyal to their rule. Thus the Empire failed to either negotiate or enforce compliance. Hence, Prince Nicholas of Montenegro began military offensives, striking the villages of Pepaj and Arzhanicë on October 31 - November 1, 1879. The locals resisted these offensives and sparked a significant mobilization of Albanian volunteers to Gusinje and Plav from other regions. On December 4, 1879, Montenegrin forces under the command of Marko Miljanov launched an attack at the Valley of Nokshiq. The League of Prizren was led by Ali Pasha of Gucia and halted the Montenegrin advance. Though both sides suffered significant casualties, the Albanian determination alarmed both the Great Powers and the Ottoman Empire and signaled future complications. Further attempts were made to force Gusinje and Plav to surrender in compliance with Berlin, but the attempts failed. Prince Nikolla, therefore, sent approximately 9,000 troops to the front. This was matched by the League of Prizren's mobilizing approximately 7,000 troops and volunteers from various lands claimed by the League to defend Gusinje and Plav. On January 8, 1880, the Albanian forces defeated the Montenegrin troops, a victory that helped form international perceptions of the Albanians as a people with national consciousness and prodded the Great Powers to consider alternative solutions for Gusinje. Between 1878 and 1912, Plav and Gusinje existed as a de facto independent state. Chisholm, Hugh, ed. (1911). "Dulcigno". Encyclopædia Britannica 8 (11th ed.). Cambridge University Press. p. 652.
iSV (22 March 2009). "недвижимость Черногории :пляжи". Real-mne.com. OOuSI staff (2003). Österreichische Osthefte. 45:1-2. Österreichisches Ost- und Südosteuropa-Institut. p. 227. Retrieved 30 October 2010. Rymut, Kazimierz (1981). Gegenstand und Methoden der Onomastik. Ossolineum. p. 56. ISBN 978-83-04-00227-2. Williams, Gisela (7 January 2010). "The 31 Places to Go in 2010: 24. Montenegro". New York Times. World Climate staff (2011). "WorldClimate: Ulcinj". Retrieved July 2012. Gawrych, George. The Crescent and the Eagle: Ottoman Rule, Islam, and the Albanians, 1874-1913. London: I.B. Tauris, 2006. pp. 61-62. ^ Frashëri, Kristo. Historia e Popullit Shqiptar, vol. 2. Chapter V. pp. 178-183. Recherches albanologiques: Folklore et ethnologie (in French). Pristina: Instituti Albanologijik i Prishtinës. 1982. Martini, Luigi (2005). "Prek Cali, Kelmendi Dhe Kelmendasit". ISBN 9994334077 Publisher: Camaj-Pipaj. "History of Albania". Lonely Planet. Retrieved 5 January 2012.